The stakes of the fiscal showdown couldn’t be higher for people who depend on affordable housing. Inside the Beltway, the weather has turned cold, trees are mostly bare, and sounds and voices outside are distinct as more and more people remain indoors. On Capitol Hill, conversations are focused on billions and trillions, cliffs and sequestrations, and theories and suppositions about ongoing negotiations. A thankful media cheers on, discovering a new horserace to replace the one just ended. But for too many people—most of whom receive little or no attention in this town—there is nothing vague, abstract, or racy about these budget decisions. Amy Clark is the communications director for the National Low Income Housing Coalition (NLIHC), a nonprofit organization working to ensure that low-income people have decent, affordable homes. She says that NLIHC staff members now regularly receive anxious e-mails from people living in public housing, or who have vouchers they use for rental assistance and whose homes are on the line. “They are trying to figure out what Congress is doing, and what sequestration is about,” Clark tells me. “Are those of us who have Section 8 in danger of losing our apartments?” asked another person. Indeed, the Campaign for Housing and Community Development Funding (CHCDF)—a group of seventy-four national organizations across the country—estimates that the 8.4 percent cut to housing and community development programs that would occur in January under sequestration would result in: a $1.6 billion cut in tenant-based rental assistance, with 185,000 households losing assistance; an $830 million cut in project-based rental assistance, with more than 92,000 households losing their housing if the cuts aren’t restored; a $180 million cut to homeless assistance grants—nearly 146,000 people would be homeless instead of housed; a $32 million cut to housing for the elderly, with 114,000 households receiving reduced unit maintenance and supportive services; a $28 million cut to housing opportunities for persons with AIDS, resulting in more than 4,700 households losing their housing; and a $13 million cut in housing for persons with disabilities, leading to more than 24,500 households receiving reduced unit maintenance and supportive services. At a time when there are only thirty affordable and available rental units for every 100 extremely low income households, and low-income housing programs serve only about one of four people who qualify for them, sequestration would negatively affect more than 440,000 households currently receiving assistance. Further, as the Center on Budget and Policy Priorities (CBPP) notes in a paper released this week, funding for housing has already been cut by 6 percent, or $2.5 billion, since 2010. Meanwhile, the number of low-income renter households paying housing costs of more than 50 percent of their income—a financial burden associated with an increased risk of homelessness—has risen by 14 percent over the past two years. “Federal rental assistance programs have been treading water, while the need for assistance has been climbing dramatically since 2007,” report author Douglas Rice, a senior policy analyst at CBPP, told me. With child poverty already having an economic cost of about $550 billion per year (or 3.8 percent of GDP) in increased healthcare costs, worse educational outcomes, lower worker productivity, and increased criminal justice expenditures, these cuts seem short-sighted at best—especially since affordable housing is associated with increased educational attainment, improved health and increased employment access. And yet, according to Clark, every year funding for these housing assistance programs is essentially “up for grabs” in Congressional appropriations. “What we are seeing with sequestration is more extreme and more in the public eye but it happens literally every year,” she says. That’s why the NLIHC and other housing advocates are pushing for a long-term solution—funding for the National Housing Trust Fund. Signed into law in 2008 by President George W. Bush, it was designed to take the commitment to affordable housing out of the appropriations process by providing a dedicated source of funding. Ninety percent of the funding would be used for the production, preservation, rehabilitation, or operation of rental housing, and 75 percent of those funds must benefit extremely low-income households. The only problem is this: Congress hasn’t appropriated a single dollar to it. President Obama has sought $1 billion in funding for four straight years to no avail. In the short-term, among the recommendations in the CBPP paper is passing the Senate’s version of the fiscal year 2013 HUD funding bill that “averts cuts in the number of families receiving rental assistance, [and] provides modest funding increases for other priorities such as assistance for homeless individuals and families….” The CBPP also suggests that any deficit deal that doesn’t include “substantial new revenues” will force even deeper cuts to rental assistance than will occur under sequester. Translation: no deal—as terrible as that would be for affordable housing—is better than a bad deal. But in the long-run, advocates say, there needs to be a fundamental shift in federal housing policy. In 1992, Pathways to Housing founder Dr. Sam Tsemberis offered a novel approach to ending a seemingly intractable problem: “The cure for homelessness is a home. It’s that simple,” he said. He developed the “Housing First” model for the most severely psychiatrically disabled and addicted homeless people in New York City. It first provides a person with an apartment, and then combines that housing with comprehensive services in mental and physical health, substance abuse, education and employment. The apartments are scattered throughout a community, which fosters a sense of self-determination and speeds reintegration. Since its inception, the nonprofit organization has housed more than 2,000 people in New York alone. It now has affiliates in Washington (DC), Philadelphia and Vermont, and the Housing First model is used in programs across the US, Canada, Europe, and Australia. Numerous studies have consistently shown that the program ends chronic homelessness for 85 to 90 percent of participants (in contrast to a 45 percent success rate for programs requiring an individual to “get clean and sober” and take psychiatric medicine prior to receiving housing). What really made the program take off in the late 1990s was a five-year study showing that participants had higher retention rates, improved long-term housing outcomes, and decreased time in jail, emergency rooms, and hospitals—“all three of which are incredibly expensive,” says Respress—compared to participants in programs that require people to accept treatment before being offered housing. These results garnered bipartisan political support for the program. Pathways provides its wraparound services through Assertive Community Treatment (ACT) teams that use evidence-based care that has been studied since the 1970s. Each team consists of a substance abuse specialist, vocational counselor, nurse, psychiatrist, mental health worker and a peer specialist. The peer specialists are essential because they are recovering from homelessness, mental illness and addiction themselves, and show the client that recovery is possible. The team works with its clients in their homes. “You can teach a person to cook at St. Elizabeth’s Hospital on an electric stove, but then they move into their apartment and they have a gas stove and can’t get to the grocery store. It’s a whole different set of skills, so we do that in their apartment with them, which is also what the clients want,” says Respress. The total cost for the Housing First program is approximately $22,000–$24,000 annually per client. That’s about $54 a day—compared to a hospital bed at $1,500 a day, a jail cell at $735 a day, or even a shelter with services that costs $78 a day. Even keeping a person homeless costs more money than a Pathways apartment, if you add up the police trips to jail, ambulance use and emergency room visits. Currently in DC, four Pathways ACT teams—with a clinician-to-client ratio of ome to ten—serve 300 formerly homeless individuals. Additionally, a case management team serves 145 individuals identified by the DC Department of Human Services as the most medically vulnerable and hardest to serve among the chronically homeless population. These clients are also provided with individual apartments and slightly less intensive services, with one case manager for every twenty clients. The business community has been very supportive of the program, with the Downtown Business Improvement District (BID) and the Golden Triangle BID funding some street outreach services, which receive scant city funding. Six Pathways outreach workers walk the streets, get to know people in the homeless community, and develop trusting relationships that lead quickly to making the offer of housing. However, the city’s commitment to ending homelessness seems less steadfast than that of the business community. 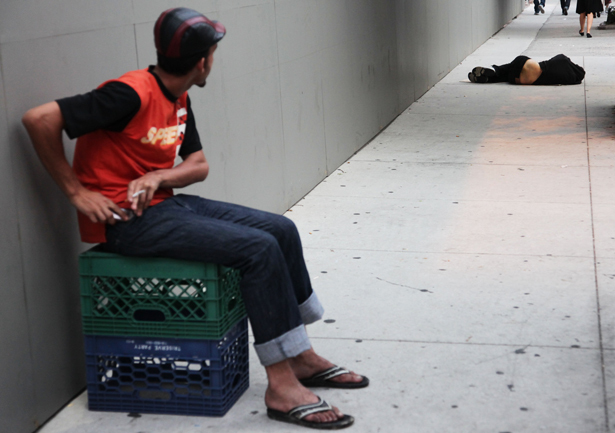 Despite the fact that there are 3,553 homeless single persons in DC—and the National Alliance to End Homelessness estimates that about 25 percent of the homeless population has serious mental illnesses—there is no dedicated source of public funding specifically targeted to address the needs of homeless people living with severe mental illnesses. Respress says Pathways to Housing DC currently has vouchers for 445 units and would need approximately 250 to 300 more to meet the needs of the very most disconnected, psychiatrically disabled homeless people. But even the city’s current vouchers are in jeopardy. You can stay informed and get involved in the effort to end chronic homelessness in the nation’s capital and elsewhere by signing up for the Pathways to Housing e-newsletter here. Tell Congress: Renew Unemployment Insurance: If Congress fails to reauthorize the Emergency Unemployment Compensation (EUC) program, 2 million workers receiving federal unemployment benefits will be abruptly cut off after December 29. In all, more than 5 million workers will be unable to collect federal unemployment benefits next year if Congress fails to act. Mobile-ize for Babies: The First 100 Days Poll: ZERO TO THREE is asking people to complete a quick poll, which it hopes will help mobilize Americans to demand that elected officials make very young children a priority during their first 100 days in office. #TalkPoverty in the Lame Duck: As Congress considers major legislation on deficit reduction, taxes and jobs, Half in Ten provides key information and resources to make the case to protect low-income families in the fiscal showdown. “More than 6.5 million people in the US receive food stamps but have no cash income,” Athens County Jobs and Family Services. “Why Women and People of Color Should Be Concerned About the Fiscal Cliff Negotiations,” Sheila Bapat. “House Vote Could Increase Asset Poverty Among Out-of-Work Americans,” Jessica Bartholow. “When it Comes to Job Creation, ‘Do No Harm’ Isn’t Enough,” Elizabeth Lower-Basch, Neil Ridley, and Kisha Bird. “Our segregation footprint,” Steve Bogira. “Single Moms Can't Be Scapegoated for the Murder Rate Anymore,” Philip Cohen. “When Domestic Workers Suffer, Our Economy Suffers,” by Bryce Covert. “In Rare Strike, NYC Fast-Food Workers Walkout,” by Josh Eidelson. “Voices From the Street, Homeless in America,” Equal Voice News. “Workers protest pay, conditions at Walmart warehouses,” Mitchell Hartman. “Why Mass Incarceration Defines Us as a Society,” Chris Hedges. “The Shocking Details of a Mississippi School-to-Prison Pipeline,” Julianne Hing. “McJobs Should Pay, Too,” Sarah Jaffe. “Powerball’s Dark Side,” Natasha Lennard. “Can People Afford to Lose Their Social Security COLA?” Trudy Lieberman. “Group’s efforts at Palermo’s part of worker center movement,” Georgia Pabst. “Poor Kids,” (VIDEO) PBS Frontline. “The GOP’s Holiday Gift Guide: Pain for the Poor, Ponies for the Rich,” Tim Price. “Deficit Reduction Deal Without Substantial New Revenues Would Almost Certainly Force Deep Cuts in Housing Assistance,” Douglas Rice. “Do Federally Assisted Households Have Access to High Performing Public Schools?” Ingrid Gould Ellen and Keren Mertens Horn, the Poverty Race and Research Action Council (PRRAC). The study finds that Housing Choice voucher holders do not generally live near higher-performing schools than households receiving other forms of housing assistance, even though the program was created in part to help low-income families reach a broader range of schools and neighborhoods. “From Urban Renewal and Displacement to Economic Inclusion,” Marcia Rosen and Wendy Sullivan, published by PRRAC and the National Housing Law Project. This study traces more than thirty years of displacement, community organizing, advocacy and innovative policy development in San Francisco that have helped mitigate the harms of gentrification; it points towards more inclusive redevelopment policies in other parts of the country. “Retail’s Hidden Potential: How Raising Wages Would Benefit Workers, the Industry and the Economy Overall,” Catherine Ruetschlin, Dēmos. The study examines what the economic impact would be if the largest retail chains raised the wage floor for their full-time employees to $25,000 a year. It finds that such a wage standard would lift 734,075 above the federal poverty line. An additional 769,191 people hovering just above poverty would see their incomes rise above 150 percent of the poverty line. “Fair Pay for Women and People of Color in New York Requires Increasing the Minimum Wage and the Tipped Minimum Wage,” National Women’s Law Center. This fact sheet provides context for the largest effort to unionize fast-food workers in the history of the US that is currently taking place in NYC, and shows how women are disproportionately affected by low wages. Ears Up, Ears Down: A Dog’s Journey Home, Ralph da Costa Nunez, Margaret Menghini and Madeline Gerstein Simon, the Institute for Children, Poverty, and Homelessness. The sixth book in a series on family homelessness and poverty, this new picture book is for children in grades K-2. Embark on a journey with a dog who becomes homeless after the junkyard where he lives is foreclosed. Economic cost of child poverty nationwide: $550 billion per year (3.8 percent of GDP). Current minimum wage: $7.25 an hour ($2.13 tipped minimum wage). Minimum wage if indexed to inflation: $10.55 an hour. Something already indexed to inflation: individual campaign contribution limits.